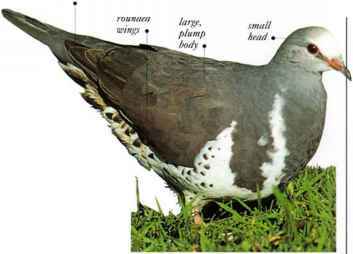 1 his stoutly built pigeon favors areas of low, thick vegetation that conceal its colors, including the double bar of iridescent plumage on its wings. These sparkle in a range of colors, from purple to bronze, giving the bird its name. It usually occurs in pairs, living unobtrusively among dense bushes and low trees, particularly in coastal heathland, or in the undergrowth of open woodland. The birds feed on the ground, mainly taking seeds, and sometimes venture into fields adjoining their normal habitat to take grain. They are cautious when visiting water, coming to drink quietly after dusk and before dawn. Their call is a subdued, mournful cooing. • NliST A substantial platform of twigs and stems, located in a small tree, thick shrub, or occasionally on the ground in a sheltered site.